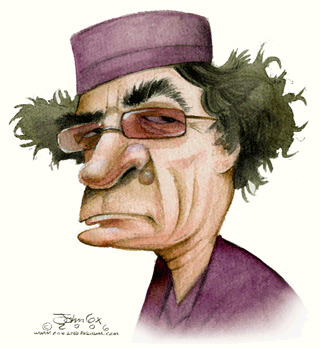 Gaddafi gets older, but certainly no wiser. The title to this story is "Arab leaders back 'wanted' Bashir "
The story is "Arab leaders have concluded their annual summit by showing their support for Sudanese President Omar al-Bashir who is wanted for war crimes." The story later says "Meanwhile, the BBC's Katya Adler, in Qatar, says earlier reports that Libyan leader Muammar Gaddafi had stormed out of the Arab League summit were incorrect." Ben, did they revise and rename the story you posted after you posted it? Very strange. Ben, If you Google "Gaddafi Storms Out of Arab League" you will find the story unredacted, unrevised and uncensored in other publications lol. Who's telling the truth? The BBC or everyone else?